WHAT IS REBUILDING TOGETHER PEORIA?Rebuilding Together Peoria is an all volunteer organization that, in partnership with the community, rehabilitates the homes of low-income elderly or disabled homeowners at no charge, so that they may live in warmth, safety and independence. Rebuilding Together Peoria’s Board of Directors is comprised of community representatives and business leaders. We are a non-partisan, non-sectarian and non-profit organization. For most volunteers, Rebuilding Together Peoria is a one-day event. Saturday, April 27, 2019, is Rebuilding Together Peoria’s 26th annual National Rebuilding Day. WHY IS REBUILDING TOGETHER PEORIA NEEDED? Many of our neighbors have worked hard all their lives and have been able physically and financially to repair their own homes for most of that time. Now due to illness, aging, inflation, or any number of uncontrollable causes, they are unable to do the repair work themselves and their homes have become unsafe and in need of repairs. The result is a loss of the homeowner’s pride, and crumbling neighborhoods. Rebuilding Together Peoria can make, and has made, a difference in people’s lives. 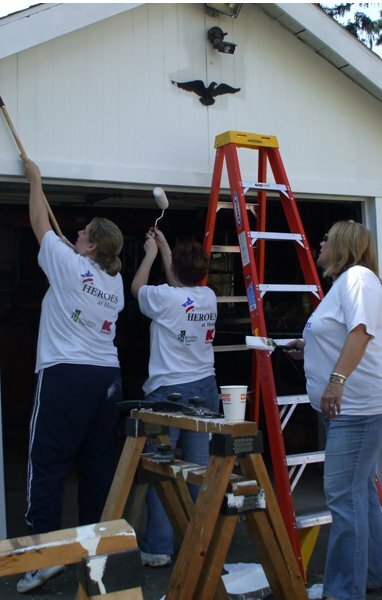 Rebuilding Together Peoria provides free assistance ranging from yard clean up to more extensive renovations involving plastering, painting, carpentry, plumbing and electrical repairs. WHO IS ELIGIBLE TO APPLY FOR REBUILDING TOGETHER PEORIA ASSISTANCE? Income-eligible homeowners (particularly the elderly and the disabled) who are not able to do the work themselves are eligible, as are non-profit organizations. Maximum eligible income is defined by the Federal Department of Housing and Urban Development (HUD). Income limits are adjusted for household size. The current maximum annual income for a one-person household is $42,700 and for a two-person household is $48,800. Individual homeowners and non-profit organizations may request an application to complete and return. Churches, businesses, and neighborhood or service organizations may also refer or apply on behalf of homeowners. A visit will be scheduled to explain the program and conduct a walk-through of the home/facility. A committee of volunteers makes the difficult decisions of prioritizing applicants. The committee’s recommendations are presented to the Board of Directors who will select the final recipients. Our goal is to renovate 15 homes and/or non-profit facilities each year. WHO PAYS FOR REBUILDING TOGETHER PEORIA REPAIRS? Funding for all repairs is provided by Rebuilding Together Peoria at no charge to the homeowner or non-profit organization. The cities of Peoria and East Peoria, Richwoods Township, Peoria County, area businesses, churches, service organizations, the local building trades, and caring individuals support Rebuilding Together Peoria’s National Rebuilding Day. WHO CAN VOLUNTEER FOR REBUILDING TOGETHER PEORIA? Volunteers must be at least 18 years old or 14 years old when accompanied by a parent or guardian. HOW DOES REBUILDING TOGETHER PEORIA WORK? Businesses, churches and service organizations make a cash donation and pledge to provide a Project Leader and 15-50 volunteers. The Project Leader will choose from a pre-selected group of projects, visit with homeowner/non-profit representative, assist with generating materials and supplies lists and coordinate the work to be performed by skilled trades’ people and a volunteer work team. Rebuilding Together Peoria will assist with the work scope, provide necessary skilled trades’ people, obtain needed materials and supplies and provide the volunteer work team with Rebuilding Together Peoria t-shirts. For more information visit us at http://www.rebuildingtogetherpeoriail.com or leave us a detailed message at 309-674-2462 and follow us on Facebook.